Do you ever have one of those days where you walk into your kitchen, look in your pantry/fridge, and wonder what you can make that will use all your odds and ends while still being edible? This meal stemmed from one of those days. I picked through my veggies and put random combinations into google until I stumbled upon a recipe for this lovely salad. 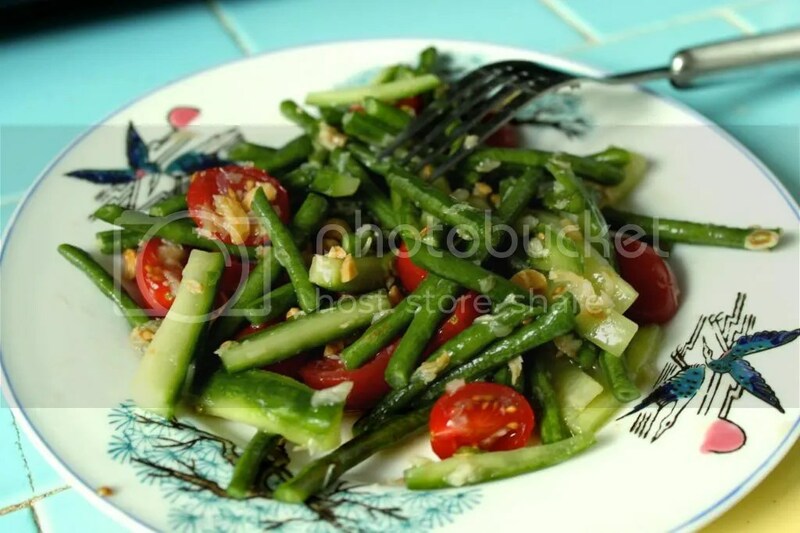 The combination of cucumber, peanuts, long beans, fish sauce, tomatoes, and dried shrimp didn’t sound particularly appealing, but let me tell you, it was delicious! One of my favorite things about Thai food is the way many dishes balance sweet and salty flavors while also offering a variety of textures and colors. Overall Thai dishes are often complex, beautiful, and light. This salad delivers on all three. Besides being refreshing and delicious, this salad is also quite easy to make. Julienne a cucumber, chop up a green chili, slice up some tomatoes, and baby, you got a stew going! The only part of the process that involved some effort was mashing up the limes, shrimp, and sugar. Unfortunately, I don’t have a mortar and pestle so I had to make do with a mug and spice jar. It was a bit haphazard but it works out quite well! The mashing was for the “dressing” of the salad which was comprised of one serrano chili pepper, two cloves of garlic, a quarter of a lime, a teaspoon and a half of sugar, a teaspoon of grated ginger, and eight grams of small dried shrimp. I seeded and minced the pepper, diced the garlic, ran the ginger through a grater, and removed the lime insides (official scientific term) from the rind. I smooshed all that and the sugar together with my cup and spice jar then added in the shrimp and ground away till it was all a nice mushy pulp. Sounds delicious right? Once you’ve got your pulp good and mushed up, it’s just a matter of tossing together the beans, cucumber, tomato, pulp, fish sauce, and lime juice. I let mine sit in the fridge for an hour(ish) so the flavors could meld together. 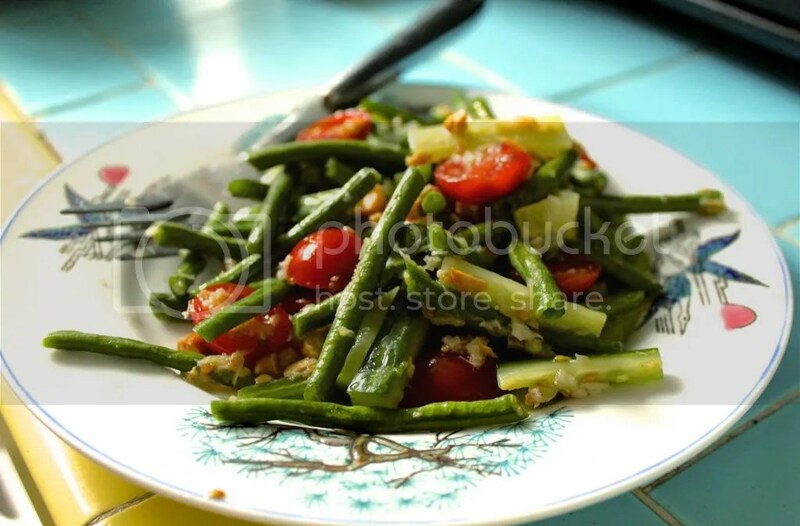 Once I was ready for salad, I chopped up some salted peanuts, tossed them in, and had myself some delicious salad. Combine serrano chili, garlic cloves, lime insides, white sugar, and ginger in a mortar or a ceramic mug. Pound with a pestle or spice container until ingredients form a paste. Add in the dried shrimp and pound until shrimp have been completely broken down and worked into the paste. If the shrimp are proving to be difficult, stir them into the paste and let sit for about 5 minutes. They will absorb some moisture and become easier to mash down. Combine paste and beans in a large bowl and mash the beans lightly with your pestle or spice container so they are lightly bruised. This will make the raw beans a bit more tender. Add the cucumber, fish sauce, tomatoes, and lime juice and stir until well combined. Let salad rest for 10 minutes to a few hours, depending on your time constraints, so that the flavors can have time to meld. When ready to serve, stir in chopped peanuts and enjoy! Thanks! I’m working on a new post now!